“Alex!” shouted Marino Cepeda as he walked into the Riverside Vets to cast his vote. Alex Cruz, police officers’ union president, stood across the street, searched for the person that shouted his name. He noticed Cepeda. Both men waved at each other. Who did you vote for? Cepeda, 58, said he voted for councilman Andre Sayegh. “I know him,” said Cepeda. He also knows Cruz. After casting his ballot for Sayegh, Cepeda crossed the street from the polling site to converse with Cruz. 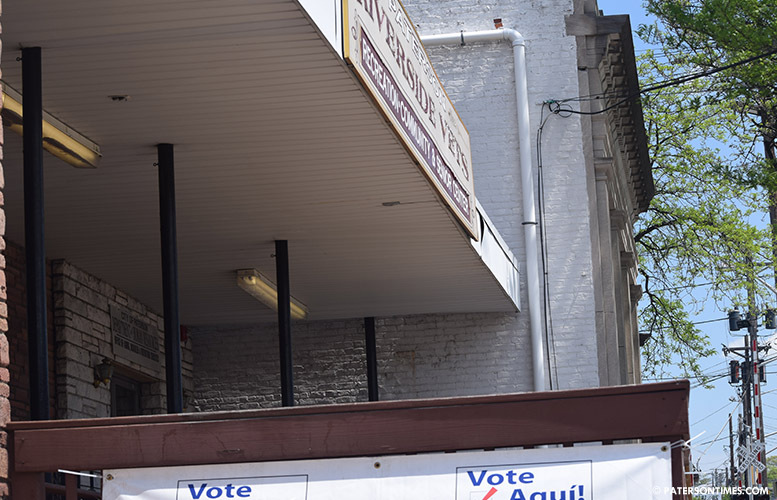 A good number of people voted for Sayegh at the Riverside Vets early Tuesday afternoon. But, majority of those interviewed, said they voted for Alex Mendez. Ashley Bacote, 29, was among the Sayegh voters. “I voted for him four years ago. I feel like he has the best vision for Paterson,” said Bacote. A 71-year-old man from the Riverside section said he voted for Sayegh. He would not give his name. “Reduce taxes,” he urged the next mayor. Write-in at-large candidate Nelly Celi walked into the polling site. She came out and said she voted for Sayegh. “He’s the man to go for. He has the right state of mind,” said baseball coach Frankie Roman, 28, of Sayegh. Marie Fleurgin, 38, voted for Sayegh because Rep. Bill Pascrell voted for him, she said. There was no Sayegh contingent posted at the Riverside Vets. A man sat on 5th Avenue and River Street with McKoy signs. A small group stood with Cruz signs on the opposite side of the polling site on 5th Avenue and East 13th Street. Opposite them were a group of men from the Mendez’s campaign. Mendez had a strong showing at the Riverside Vets. Cruz had a large truck with his sign parked on 5th Avenue, steps away from the polling site. No one interviewed indicated a vote for Cruz. Sayegh had good showing at School 13 which covers two districts in the 4th Ward. He campaigned hard for the African-American votes. 12 interviews were conducted at School 13. 5 voted for Sayegh. 3 McKoy. 1 Mendez. 1 Cruz. and 2 Jackson. “We don’t have anything our children can go to,” said Alice Hutchinson, 27. She met Sayegh when she was president of the Youth City Council. She hopes Sayegh creates after school programs for young people. Some summer jobs for young people would help, said Hutchinson. “It was a hard vote,” said postal worker Junito Crespo. He voted for Cruz. “Our thing is corruption. I don’t know what’s with New Jersey mayors,” said Chris Spencer. He voted for McKoy. Two of the city’s mayors in the past two decades were convicted of corruption.